Crimps come in hard and soft metal. 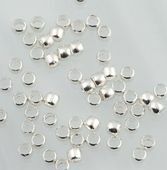 Hard crimps and most suitable for using to finish the ends of necklaces, while the softer variety is great for positioning around a necklace or bracelet to act as stoppers for beads (known as a floating bead necklace/bracelet). When using a crimping tool, the soft crimp is best. Crimp covers serve to hide crimps. Once you have squashed a crimp in place, if it is visible, it may be square in shape or rough on the edges; a crimp cover, available in 3mm, 4mm and 5mm will cover the crimp neatly and appear like a small bead.